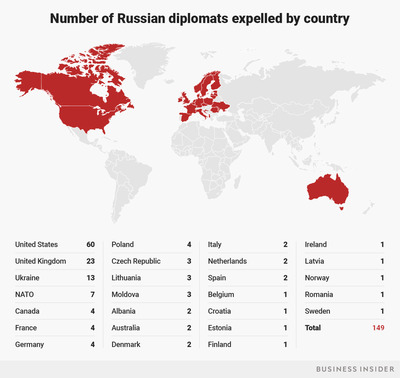 More than 20 countries have expelled Russian diplomats in retaliation for the poisoning of ex-spy Sergei Skripal with nerve agent in Salisbury, southern England. The nations joined Britain in blaming Russia for the attempted assassination on March 4, which was the first offensive use of nerve agent in Europe since World War II. Russia has repeatedly denied their involvement. The total figure is 149.